June 14, 2017 - New Yorker Electronics is distributing the new Vishay DCRF (Direct Water-Cooled Power Wirewound Resistor) for high-power applications. Available in seven different lengths, the Vishay Super 12 Featured Product saves space by reducing the number of components required to dissipate heat. By providing direct liquid cooling without the need for a heatsink and multiple resistances, the Vishay MCB device also saves on assembly costs. The WCR makes a direct connection to the water circuit per G3/8 female for easy cooling system connections. The Vishay Direct Water-Cooled Power Wirewound Resistor is optimized as a snubber and DC grading resistor for large drives, high voltage inverters, rectifiers and HVDC (High Voltage Direct Current) transmission systems / SVC (Static Var Compensators). The WCR offers very high power dissipation up to 2500W at 60°C water inlet temperature and tolerates high pulses up to 5000W for 10s. It features a resistance range from 4.7Ω to 56kΩ with a ±5% tolerance, a temperature coefficient of 100ppm/°C, and a maximum working voltage to 3500V, with 6600V available upon request. The RoHS-compliant device offers a non-inductive option below 250nH and operates over a temperature range of -55°C to +120°C. 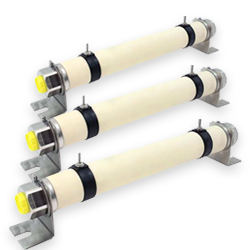 Typical applications for the device include Snubber, Permanent Discharge, Balancing and Filtering.